In The Dangers of a Shallow Faith, renowned theologian A.W. Tozer warns believers in Christ against the great danger of spiritual lethargy. He urges Christians to be aware of the times in which they live and to recognize how attempting to live a life for God on autopilot will actually undermine their faith. 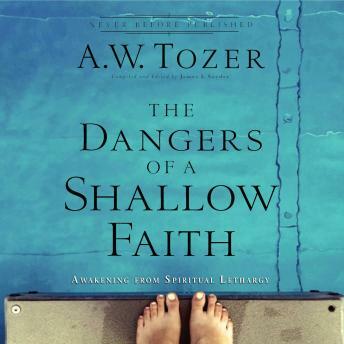 For Tozer, the risks are so significant that "breaking out from the tyranny of spiritual lethargy--whatever the cost--should be the number-one priority of every Christian. "In this never-before-published compilation, followers of Christ will discover anew the importance of standing boldly against spiritual and moral slumber. They will also see the importance of remaining awake in the face of constant temptation and distraction. Discover the spiritual awakening and change the Holy Spirit can bring to your life as you surrender completely to God and walk in a deeper faith!